Ibiza Holidays Free Child Places 2019 @Web2travelDeals. Online Since 2000. Finding the Best Value Holidays with Free Child Places Ibiza from U.K. airports. Popular resorts include Cala Gracio, Santa Eulalia, Es Cana, San Miguel, San Antonia Bay, Portinatx, Port des Torrent. Stop wasting time checking website after website, looking for Ibiza Holidays Free Child Places 2019, only to find that the deal advertised has expired or does not exist. We understand from reading online reviews, how frustrating it can be for you, when searching for hours for Family Holidays Ibiza, only to find that the headline deals advertised are only available in May or September or twice the price during the School Holidays. Ibiza Holidays @Web2travelDeals is designed to save you time and money when searching for Free Child Places Ibiza 2019. 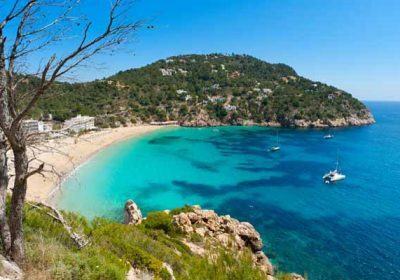 We regularly check with Top Tour Operators to find out which Ibiza resorts have holidays from the UK to Ibiza with Free Child Places School Holidays. This post Ibiza Holidays Free Child Places 2019 shows you hotels and apartments which our team have visited to check that free child places were available during School Holidays, on the date that this post was updated. Insotel Club Tarida Playa, CALA TARIDA, IBIZA, SPAIN. Get More Information, and claim your Free Child Place Insotel Club Tarida Playa, CALA TARIDA, Ibiza. Holidays to Ibiza with Free Child Places deals shown below are for previous years – Still to be updated for 2019. Free Child Places Hotel Presidente, Portinatx, Ibiza. 3 star. Free Child Places San Miguel Beach Club, Puerto San Miguel, Ibiza. 3 star. Free Child Places Insotel Tarida Playa, Cala Tarida, Ibiza 4 star. Free Child Places Fiesta Hotel Milord, San Antonio Bay, Ibiza. 4 star. Free Child Places Fiesta Tanit Hotel, Cala Gracio, Ibiza 3 star. Free Child Places Family Life Club Aura, Port Des Torrent, Ibiza 4 star. Total price for 7 nts All Inclusive including flights from U.K. (based on family of 4) from £2385. We found free child places on all inclusive holidays to Ibiza available with flights from Inverness, Edinburgh, Glasgow, Belfast International, Newcastle, Leeds Bradford, Manchester, Liverpool, Humberside, East Midlands, Birmingham, Bristol, Cardiff, Gatwick, Exeter, Bournemouth, Southampton, Southend, Stansted, Luton, Norwich during July 2018. Fiesta Tanit Hotel in Cala Gracio, Ibiza – 3 star, All Inclusive. 7 nts All Inclusive from £2385 (total family of 4) Dep Stansted July 2018 (Deposit £300) Includes One Free Child Place. Fiesta Tanit Hotel in Cala Gracio, Ibiza – 3 star, All Inclusive. 7 nts All Inclusive from £2454 (total family of 4) Dep East Midlands July 2018 (Deposit £300) Includes One Free Child Place. Fiesta Tanit Hotel in Cala Gracio, Ibiza – 3 star, All Inclusive. 7 nts All Inclusive from £2763 (total family of 4) Dep Edinburgh July 2018 (Deposit £300) Includes One Free Child Place. Casa Luis Apartments Santa Eulalia, Ibiza, 3 star, self catering, from £1458 (family of 4) dep in July. More Information and Online Booking. Intertur Hotel & Apartments Miami Ibiza Es Cana, Ibiza, 3 star, All Inclusive, from £2156.84 (family of 4) dep in July. Balansat Torremar Apartments San Miguel, Ibiza, 3 star, All Inclusive, from £1618.35 (family of 4) dep in July. Playa Bella Apartments San Antonia Bay, Ibiza, 3 star, All Inclusive, from £1657.72 (family of 4) dep in July. Hotel Orquidea Santa Eulalia, Ibiza, 3 star, All Inclusive, from £2151.97 (family of 4) dep in July. Holiday Village Seaview Ibiza Port des Torrent, Ibiza, 4 star, all inclusive, from £1639 (family of 4). Check Availability Free Child Places Es Cana with First Choice. Fiesta Tanit Hotel Cala Gracio, Ibiza, 4 star, all inclusive, from £1117 (family of 4). Check Availability Free Child Places Ibiza with First Choice. Hotel Presidente Portinatx, Ibiza, 3 star, all inclusive, from £1170 (family of 4). San Miguel Beach Club Puerto San Miguel, Ibiza, 3 star, all inclusive, from £1221 (family of 4). Check Availability Free Child Places Ibiza with Thomson. Sirenis Hotel Club Aura Port des Torrent, Ibiza, 4 star, all inclusive, from £1350 (family of 4). Hotel Presidente Portinatx, Ibiza, 3 star, all inclusive, from £1110 (family of 4). Fiesta Hotel Milord San Antonio Bay, Ibiza, 4 star, half board, from £981 (family of 4). C’an Sanso Apartments Santa Eulalia, Ibiza, 3 star, self catering, from £828 (family of 4). Es Cane Apartments Es Cana, Ibiza, 3 star, self catering, from £718 (family of 4). Sa Tanca Apartments Cala Llonga, Ibiza, 3 star, self catering, from £855 (family of 4). Other holidays were available without Free Child Places in alternative hotels and apartments at similar prices. Our experience has shown that the number of Free Kids Places for Ibiza Holidays is generally limited and you should try and book as far in advance as possible to guarantee a place for your family holidays. View Ibiza flight and hotel deals for holidays without free child places on www.web2travel.co.uk.